RED GARNET (Almandine), the most common type, is dark red to brownish red. 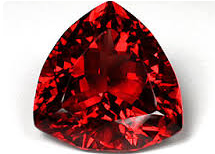 Pyrope is blood red. RHODOLITE, one of the most popular varieties, ranges from pink to purplish red and is mined in Africa, India and Sri Lanka. TSAVORITE is bright yellow green to grass green and is also mined in Tanzania and Kenya. HESSONITE & SPESSARITE mostly come in golds, oranges and browns. Giri Corp, - Created Emerald. CUT COLOR CREATION CLEARITY CARAT" - 5C's.........GIRI CORP. Copyright(c) 2013 under GIRI CORPORATION CO. LTD. All Right Reserved .